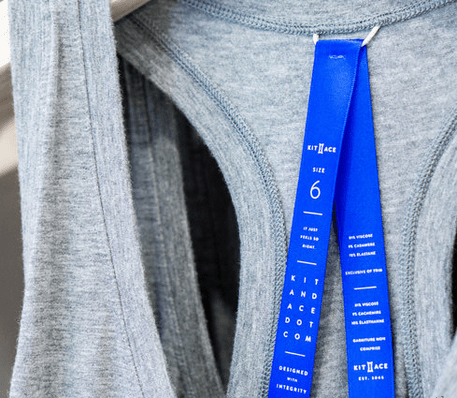 "The son and wife of Lululemon founder Chip Wilson have launched their own clothing line of street wear they say can perform like athletic wear." "JJ Wilson and his mother, Shannon Wilson, sell Kit and Ace out of a freshly opened store of the same name in Vancouver's trendy Gastown neighbourhood." "The pair have created an interesting luxury fabric blend called qemir, which is made up of 81 per cent viscose, nine per cent cashmere, and 10 per cent elastane. The material is used for the company's women's line." Takeaway: This new concept is distinctively LULU, from the layout and presentation down to the little rippable tags. Chip can't be involved owing to his non-compete, which is unfortunate because if there is one thing that this guy has proven that he can do, it's build a brand. He's in print talking about how frustrating his transition out of management has been for both him and his wife, and we think that's one of a whole host of factors that ignited his decision to hire Goldman Sachs. Bottom line - Chip wants to be in the drivers seat, whether that's at Lululemon or another entity all together. Two likely outcomes to Chip's activism 1) he sells his shares and starts a new brand, or 2) he works with a strategic buyer to sell LULU outright and reinstates himself into a leadership position within the company. Either way it's a positive event for the stock. "U.S. sportswear group Nike will supply shirts to more teams in the top five European soccer leagues this season than Adidas, but the German firm has cornered the most lucrative clubs, a study showed on Wednesday." "Sports marketing research group Repucom said Nike had outpaced Adidas in Europe for the first time since the 2009/10 season to supply 26 of the region's top clubs, up five compared with last year. Adidas is supplying 18, down four from last year." "Although it has been a serious player in soccer only since 1994, Nike is now threatening Adidas's leadership in the sport. At the World Cup in Brazil, it supplied more teams for the first time and put its boots on more than half the players." Takeaway: Nothing groundbreaking here, but one of the better articles we've seen with facts and figures on the soccer endorsement landscape. It's worth a read. "Amazon Same-Day Delivery available for customers in Baltimore, Dallas, Indianapolis, Los Angeles, New York City, Philadelphia, Phoenix, San Francisco, Seattle and Washington DC metro areas. Customers can order as late as noon, seven days a week and get things like popular movies, video games, last-minute travel needs, back-to-school supplies and family necessities delivered to their home the same day. Prime members pay $5.99 for all the same-day delivery items they can order." Takeaway: Not sure how important it is for the average consumer to get DVDs, Video Games, and 3-ring Binders on same-day delivery terms. But the need certainly increases when it comes to household items -- especially consumables. AMZN is still in the infant stages of building out this infrastructure. But regardless, the value proposition at $5.99 is pretty tough to beat. That's about how much people would otherwise spend on gas to hit all the different stores to get the items -- not to mention the implied cost of consumers' time. This is a bit of a sleeper strategy for AMZN, in that nobody really cares about it now, but they'll be forced to in a few years' time as AMZN builds up density. "Amazon.com Inc. is giving special privileges to companies that sell their wares directly through its online store, according to a new study." "Companies such as Burberry Group Plc and Levi Strauss & Co. that partner with Amazon have scored unusual deals that let them control how their merchandise is sold through the world’s largest online retailer, according to a study by market researcher L2 to be released this week. The companies have been able to limit the sale of goods from third-party resellers, a practice Chief Executive Officer Jeff Bezos has traditionally let run unimpeded over objections from some brands." "Selena Gomez introduced her new collection to her 12 million Instagram followers last night." "Pictured wearing silver high-tops with black pants, a printed sweater, denim jacket and a beanie, the 22-year-old actress spread the word about her latest collaboration with Adidas Neo faster than any marketing campaign." "Macy’s is launching an online wedding promotion in partnership with TV host and fashion consultant Clinton Kelly. Known as 'Weddings with Clinton Kelly,' the promotion will include an online wedding hub with a collection of articles and videos to help build the perfect registry, as well as advice from Kelly." "Callaway Golf Company announced today that the Board of Directors has authorized the Company to repurchase up to $50 million of the Company's common stock in open market or in private transactions. The Company will assess market conditions, buying opportunities and other factors from time to time and will make strategic repurchases as appropriate. The repurchases will be made consistent with the terms of the Company's credit facility which defines the amount of stock that can be repurchased."